Major labels simply don’t have the patience to watch a band develop. If their first album isn’t a breakthrough success, they’re quietly kicked to the curb. Most bands don’t get a chance for a second major label record. Delta Rae is the rarity in today’s music business. Carry The Fire, Delta Rae’s debut record, wasn’t a flop, but it didn’t cut through the clutter either. It did just enough, however, to allow them to create the hauntingly beautiful new record, After It All. The subjects on After It All find themselves searching, struggling. Feeling lost and disconnected. Yet there is a sense of warmth and comfort in these songs written by brothers Eric & Ian Hölljes, thanks in part to some seriously seductive harmonies from Brittany Hölljes & Elizabeth Hopkins. We chatted for 20 minutes with Eric Hölljes of Delta Rae while he was in Nashville (writing songs, of course) and we easily could have talked for 60. Our discussion revolved around the new album, songwriting, blind dates with other songwriters, re-recording songs, vinyl and album number three. When we last talked nearly three years ago, Carry The Fire had only been out for a couple weeks and you said that you had already laid out the basic outline for the next record. Did the outline hold or did you scrap it and start from scratch again? I would say that it changed a lot. We’ve grown a lot as a band and some of the songs that we were writing at the time made it on this record and I think that’s a testament to how much we love those songs. “Chasing Twisters” we were working on at the time. “You’re the One for Me” is on this album and that song had been written for a number of years. My brother Ian and I, when we were touring, we were writing the entire time. We were always trying to find little pockets of time where we could disappear and craft the next song that we wanted to take and try out on the road. Things really did morph over those two and a half years of touring on that first album. We wrote a lot and tried a bunch of stuff in front of an audience to see what was working. We filled the vision for the album on the fly as opposed to going in with a set idea. This album actually took over a year to record, so it’s been quite a process. Some of the songs on After It All (“Chasing Twisters”, “Run”, and “I Will Never Die”) were previously released on the Chasing Twisters EP. Was the EP a testing ground for some of the new songs or how did those songs survive to make on After It All? I think the EP was a testing ground, but unintentionally. One of the songs on the EP was a re-cut of “If Loved You” which was on our first album, but we had gone to radio with that song, and the hope was that song would resonate, there would be this big demand for our second album and we would be able to just immediately follow up, because we were already in the studio with Rob Cavallo and the album was underway. What ended up happening was “If I Loved You” did well at radio, but it didn’t go as far as we had hoped. It bought us some time to reevaluate those songs and see if we could make them more dynamic, make them better, make them more powerful. With “Run,” for example, I think we had always imagined some live strings on that song. Once we got the go ahead to keep working on the album, it wasn’t such a rushed timeline. We hired a string quartet, charted out the score and put down something that we liked more than the EP version. It was just us being competitive with ourselves and seeing if we could out produce ourselves with the album and put something together that was a little bit more cohesive and in line with our initial vision. In addition to “If I Loved You” with Lindsey Buckingham, the EP also features re-recorded versions of “Dancing in the Graveyards.” Did you enjoy going back and reworking some of those songs and are you looking forward to not retouching any songs on the new album? I think that it is a mix of both. I think when we were re-recording these songs, it was scary, because we wanted to outdo ourselves and it was a bit of a challenge. How could we record this better than we did it last time? Is it going to be better? It was just nerve racking. It was also really fun because songs had changed so much while we were on the road. I think they had gotten a bit more life infused into it. We knew how to hit the notes a little bit more confidently. It just felt a little different than when we recorded it for the first time. We were figuring everything out in the studio. Things change when you’re in front of an audience, you can feel their energy, they really have an effect on the music. So in that way it was really fun. I will say that I am really looking forward to recording new music in the future and not dwelling on, or trying to redo and improve stuff we’ve already done. I think that that’s part of growth. We’ve learned a lot in the process, but I’m ready…I think we’re all ready to look towards the future and see what we can do next. The first single off the record is “Scared.” Let’s look back at how the songwriting process happened and how the frame-work for that song was built. My brother and I wrote that song in Raleigh in my apartment. I had this chord progression that I thought was haunting and I just found myself humming it all the time. I played it for him, and he was like “I really like that. What if we made the tempo a little more upbeat?” So we sped it up a little bit, it’s throughout the song, it’s (hums the chords). Then Ian started clapping while I was playing it on piano, the next thing I knew, he goes (sings “Remember when you said you loved me, remember when you said it would all work out”). It just sort of spilled out. I kept going (sings “we packed up and we left morning and everything you promised didn’t happen, and now”). And it just sort of kept flowing, and I had always had this idea for a pre-chorus (sings “and I’m swirling, softly”). We were just stumbling upon the lyrics as we were going, and didn’t know what we were singing about yet, and at some point we caught ourselves. We were crafting the second verse, which I think really hits home with what the meaning of this song became for us. We realized this song was resonating to us because this song is about people at our age and in our position of venturing out and being in our first relationships, buying our first homes, making decisions for ourselves, and having no safety net, having no real guidance. Its real life. It’s part of the next step out of adolescence, out of young adulthood. You’re in adulthood now. You’re having to make decisions yourself. And the idea that that can be scary, was just all very honest to us. We just decided to run with the idea of a relationship, where it’s hard to commit, because it’s scary to be accountable to somebody. Sometimes that can be overwhelming and frightening. That’s where that song came from, or at least that’s what it means for us now. It just felt like an honest song and I love singing it, and it’s got this sort of weird swing, swagger to it, and it’s unlike any song we’ve ever written, and hopefully people will appreciate that about it. With the first record you had one producer (Alex Wong), but with After It All, you have several producers (Rob Cavallo & Peter Katis). Did it ever feel disjointed or were you confident that despite different producers, you’d have a cohesive album? There was always some concern about that when it’s passing through so many hands. But really what was so cohesive about it was that the band was playing everything and that Ian and I were writing everything. We were in the studio for the entirety of the project no matter who was at the helm. So, I think we had a lot of confidence that we would be able to pull it altogether and make it something that felt united even though it was spread out over a year and in three very different regions of the country. In fact, I think that those challenges actually ended up becoming a big strength for the album. It reflects parts of the South, parts of the Northeast, and parts of the West Coast where we were creating the music. That’s subtly imbued in how it was recorded. I’m just going to assume you’re already writing songs for album number three. Yes, sir. I’m actually in Nashville right now. I’m doing a little bit of writing before we go on tour just to scratch another itch. Ian and I have been writing for Delta Rae ever since we got in the studio. I think the best part of the healthy cycle of it all for us is when we’re on tour. You’re hoping that people show up to the show, then you want to put on a great show, and a way to alleviate some of that pressure is to just divert that energy towards song writing. A little bit more fun and a little bit more free. Just go to a piano or a guitar and just do something totally brand new, with no pressure. It doesn’t have to be on the album, but let’s just make something we love. I think it’s a bit of therapy for us every time that we’re doing something that feels pressurized, we love to song write, because that’s our playground. Speaking of songwriting, you had writing credits for a song on the latest Rascal Flatts record. I signed a publishing deal before Delta Rae got signed to Warner Brothers and I really was making an effort to meet as many writers and artists as I could to leverage the success that I had in 2010 writing a pop song called “Cooler Than Me.” One of the first co-writes that I did here in Nashville was with an amazing songwriter named Marcus Hummon, who wrote “Bless the Broken Road” for Rascal Flatts and “Cowboy Take Me Away” for the Dixie Chicks and some of my favorite country songs. I was really lucky and nervous to be in the room with him. We wrote a song in that first session called “I Have Never Been to Memphis” that I loved and it started out as the idea of moving to the South and taking a risk to be with somebody that you love. 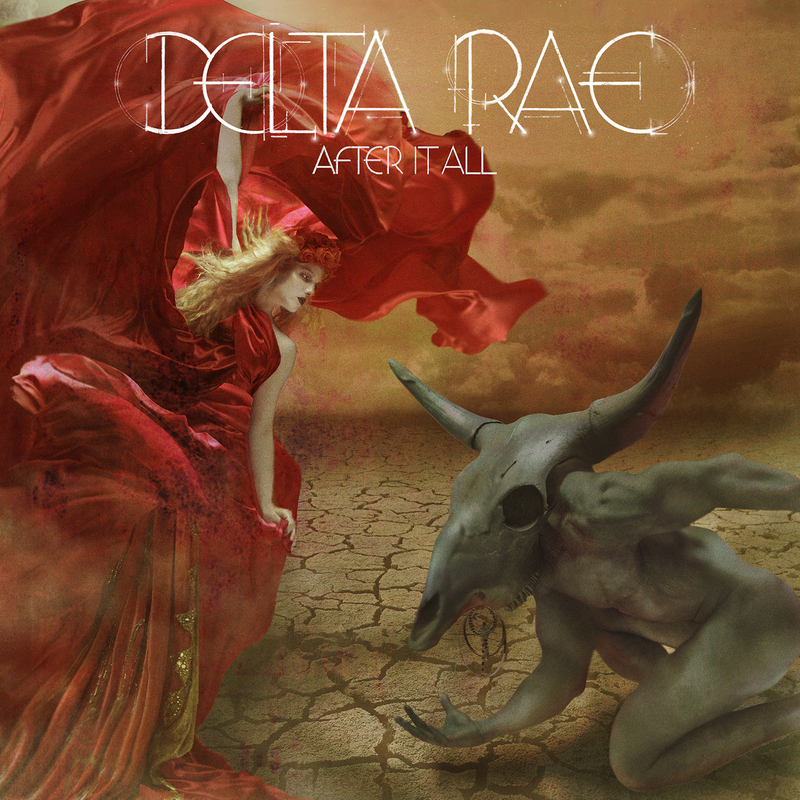 Then my band loved the song and Delta Rae started performing it for about a year. But it just didn’t feel like our song. It’s hard to describe, we loved performing it. Our fans really liked it, but it didn’t feel like our song. Eventually, we sort of retired it, hung it up. Marcus made a great demo of it, started pitching it and eventually it found its way to Rascal Flatts. They did a cut, and I think it’s funny sometimes things just work out the way. Ian is a co-writer on that too, because when it was with Delta Rae, he helped write some of the stuff at the end. Has that opened additional doors for songwriting for you? Have more people come knocking your way? I think more than people knocking on my door, it’s just when I knock on theirs, they’re more willing to open it. That’s all I can ever ask for. I just left a session writing with Dan Layus, who’s the lead singer of Augustana. They’re still putting out great music. So he and I got together and I’d never met him before. It’s a bit like a blind date, but then we wrote a song I really think is pretty and I just feel very luck every time I get to spend time with some of these artists that I grew up admiring. So, in that way, it’s definitely changed some things, and opened some doors, and I’m just hoping to take advantage of some of those opportunities. The upcoming set of live shows, you have a large band to begin with and now you’re adding an additional member for the tour. Yes, we are. And it’s an amazing violinist named Claire Wellin that we’ve asked to join us. We first heard her when she was on tour with the musical Once. I just love the music from Once and I love the theatrical performance. She really stood out. We held auditions and she just knocked it out of the park. So, the idea of having the real violin sound was so appealing to us. It’s one of our favorite instruments. We thought we might be able to do it on this tour. We’re trying it out and I think it’s going to be amazing. We did some rehearsals with Claire and she’s fantastic. I think it’s really just going to make the show even more dynamic and fun. The vinyl resurgence continues to build steam, but Carry the Fire didn’t get a vinyl release and After It All, at least as of now, is not getting a vinyl release. After It All will get a vinyl release. It’s just taking us longer than we had hoped in part because the constraints of vinyl. I mean this album has 14 songs it. One of the songs is going to have to be cut. So we had to make those decisions and just in order to fit the format. I mean everybody in the band has record players and we love vinyl. It was heartbreaking that we didn’t get to release vinyl of Carry the Fire, but hopefully, we’ll be able to do a reissue at some point. It’s definitely on our minds. And everyone can expect to have a vinyl of After It All coming out later this year. Have you found any treasures vinyl shopping lately? Yes. I play this in any format, but vinyl is my favorite. George Winston is a folk piano player who I grew up listening to. I’m self taught on piano…I just love the way he plays. I would teach myself his songs. So, my aunt recently for my birthday she sent me a bunch of records. One of which was George Winston December and especially on a day like today, and where it’s cold and rainy, I’d play it nonstop. It’s definitely…my kind of music. Your band is a bit of a rarity nowadays. Most major labels, if a band doesn’t break through the clutter, they don’t get a chance to make a second album. I feel very lucky that we get a chance to continue making music. It’s really a gift. I think every time things get difficult or I feel like I’m overwhelmed, I have to remind myself that I’m doing something I really love and is there anything else I would rather be doing? No. I’m very lucky.